Old Script Finder provided three different plugins: The Multi-Server Report Tool, a cPanel plugin, and a WHM plugin. The Multi-Server Report Tool allows you to see scan results from multiple different servers all in one place. For installation instructions, see the Multi-Server Report page. 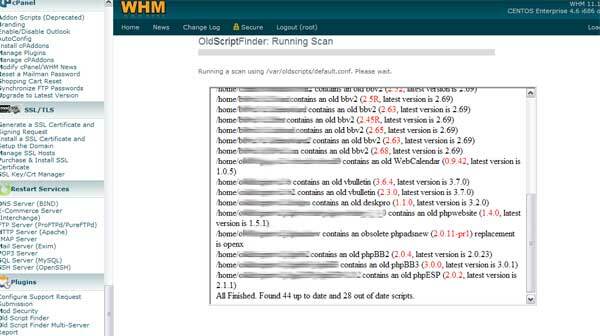 The WHM plugin allows you to run Old Script Finder directly from your WHM, without needing to log in to a command line. Download the WHM Plugin from the Subscribers Area. Make sure addon_oldscriptfinder.cgi has execute permission (usually 700). That's it! Click Old Script Finder in your WHM. The cPanel® Plugin allows your users to see the results of the scan for their files. Optionally, (and NOT enabled by default) it can also allow users to run their own scans on their home directory. The cPanel® Plugin requires cPanel® 11.x or higher. Download the cPanel Plugin archive from the Subscriber Area. This will install the plugin for you. This is NOT enabled by default. Note that you'll need to do this each time you upgrade Old Script Finder too. If the permission on /usr/bin/oldscriptfinder is not 755, no option to scan will be shown to users. That'll create the data file that's used to display the results in cPanel. If you wish, create a config file named /etc/oldscriptfinder-cpanelplugin.conf . Unlike other config files, it must be chmod 0644, as cPanel runs as each individual user rather than root. It will be used for all scans that users perform from within their cPanel. Don't include the peruserxmlout etc options here - that's done automatically. It's mainly useful if you have certain directories you wish to exclude, wish to set a maximum memory/time limits etc. That's it! An Old Script Finder button should have appeared in your users' cPanels. An option in the Feature Manager in WHM should also appear, so you can disable the Old Script Finder plugin, or only allow it for certain users, as you wish.